Bruce Cumings on the reasons for optimism about peace in Korea. Bruce Cumings has written many books, including The Korean War: A History and North Korea: Another Country. He writes for The Guardian, The London Review of Books and The Nation and he teaches at the University of Chicago. This interview has been edited and condensed. Listen to Bruce Cumings on the Start Making Sense podcast. Jon Wiener: We know what Donald Trump wants out of the Korean talks in Singapore: he wants the Nobel Peace Prize—so he’s pretty motivated to get some kind of deal. 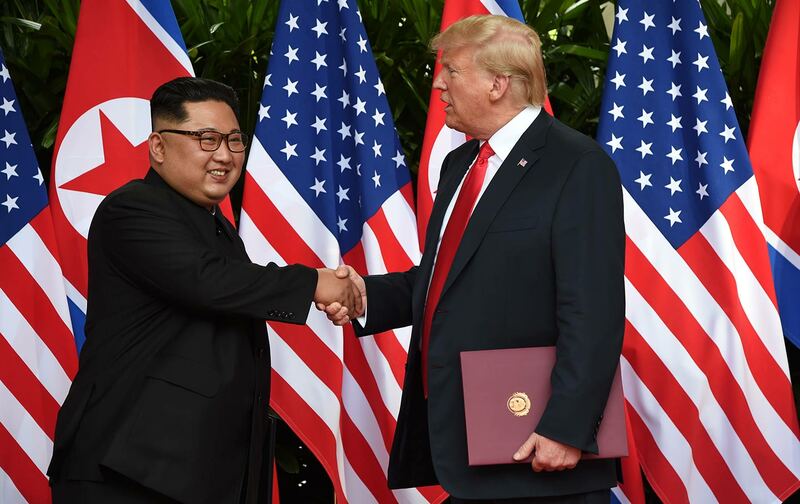 According to some commentators—for example Nicholas Kristof at The New York Times—Trump made a huge concession, the suspension of military exercises with South Korea, on top of the broader concession of the summit meeting itself, unprecedented in the last 75 years, and the legitimacy the summit gives to Kim. In exchange for these concessions, Trump seems to have won astonishingly little, Kristof argues: in their joint statement, Kim merely re-affirmed the same commitment to denuclearization of the Korean peninsula that North Korea has made repeatedly since 1992. I wonder if you agree with that reading of the joint statement. Bruce Cumings: No, I don’t agree with it. The U.S. has refused to talk to North Korean leaders since 1945; more specifically, since February 1946, when Kim Il-sung came to effective power as the head of an interim people’s committee, which the American occupation commander in the South refused to recognize. We have refused to deal with North Korea ever since. The point of this first meeting between Trump and Kim was to begin a process in which North Korea would no longer be a nuclear weapons state. As for canceling the military exercises, the U.S. did that back in 1994. Bill Clinton did that as a concession to the North. South Korea’s one of the only countries in the world where the U.S. could get away with gigantic military exercises with tens of thousands of troops, both Korean and American. The Pentagon probably won’t be too happy about not doing do these games, but it’s a small concession. JW: Trump called the war games “provocative.” What did you think of that? BC: No president has ever said that before, but he’s right. In his own madness, he brings innocent eyes to the Korean situation. He doesn’t know much about it, he doesn’t know the history, but in the war games, the Americans game out how to decapitate the North Korean regime—for example, how to overthrow it by sending the Marines into the Port of Wonsan and marching across the peninsula to take down the government. They also have simulated nuclear drills. President Obama during one of these games sent B-52s to drop dummy nuclear weapons on South Korean islands. These are very threatening to North Korea, they always have been, but I’ve never heard a president say they’re provocative. Trump’s utter lack of experience and his lack of any ties to the Washington foreign policy establishment give him a certain freedom to do something like this. JW: Trump before the meeting said, “They have to de-nuke,” and Secretary of State Mike Pompeo adds that it has to be “complete, verifiable and irreversible.” What does North Korea want in exchange? BC: They want a peace treaty to end the Korean War, which I think is quite doable; and also something Trump seems to want. He thinks he might get a Nobel Prize out of that. I don’t think that, but others might. Kim wants cessation of the war games, which he’s already gotten, and normalization of relations with the U.S.—which would probably have to come in the context of a peace treaty, because you really can’t sign a peace treaty with a country that you don’t recognize. Fourth, they want a lot of aid. Trump several times mentioned that the war games were so, so expensive. Well, so is our presence in South Korea, with 28,000 troops, 50,000 more in Japan, and the Third Marine division in Okinawa. They’re not defending Japan, they’re oriented toward fighting if a war were to break out on the Korean peninsula. That whole entourage of forces costs tens of billions of dollars a year to maintain. I saw one estimate that, when you factor in all the things that we use to deter North Korea or to prepare for fighting North Korea, it might be $40 billion a year. JW: How much would North Korea like in American aid? BC: North Korea is probably looking for something like a billion or two billion a year in aid in return for giving up their nukes and their missiles—which is essentially what they nearly got back in 2000 from Bill Clinton. It’s a drop in the bucket, and a small price to pay to denuclearize North Korea. But the whole business of ‘denuclearization’ is a misnomer because they want us to withdraw our nuclear forces from the region, B-52s, B-1 bombers from Guam, and Trident nuclear submarines, all of that has to presumably be reoriented away from the Korean Peninsula. Even then we have bombers that can lift off in the Midwest and bomb North Korea, turn around and come home without landing. So we will never be able to fully satisfy North Korea short of giving up all of our nuclear weapons. But I think we’ve already achieved something that some of the best experts in the U.S. have called for for years: the moratorium on testing missiles and testing atomic bombs. That’s been in effect since last November. JW: Is Kim thinking about the Chinese model of a one-party state and very aggressive economic development? BC: According to South Korean experts that I know, he wants to be the Deng Xiaoping of North Korea, in that Deng in 1979 made fundamental reforms that were irreversible, pushing China to join the world economy and follow Japan, South Korea and Taiwan in an export-led development model with heavy involvement of the state. Of course they’ve done very well, growing by double digits annually for most of the last 30 years. I think that’s exactly what the North Koreans are hoping to do. Simply because of the size of the countries, probably Vietnam is a better model for North Korea than China. But with both Vietnam and China you have two states that have grown very rapidly using market principles while having heavy state involvement and ultimate power in the hands of the Communist Party. So I think that model is very influential in North Korea. JW: It would be foolish to try to predict what Trump will do. My guess is that he’ll probably quit the talks a couple of times, threaten more fire and fury and then go back to negotiating. What do you think? BC: There’s a silver lining in having Trump as president: he is untethered to anybody, especially the Washington establishment, and in a curious way he may be able to make a lot of progress when all those other folks would raise all kinds of problems and insist on a laundry list of all the things North Korea has to do to please us. We seem to be in a different realm now. I don’t think much was accomplished at the summit, but Trump is a person who likes to get to know people, and he seemed to cotton up to Kim Jong-un. I’m fairly optimistic at this point.